The US dollar had a positive week, resisting unconvincing data. Now comes the biggest test: the Fed decision. In addition, we have US Building Permits, rate decisions in Japan and in New Zealand, as well as other events. These are the main events for this week. US Building Permits: Tuesday, 12:30. The number of new residential permits is expected to rise to 1.17 million in August. Stephen Poloz speaks: Tuesday, 17:45. BOC Governor Stephen Poloz will speak in Quebec. US Fed Decision: Wednesday: statement and projections at 18:00, Yellen’s press conference at 18:30. NZ rate decision: Wednesday, 21:00. Governor Graeme announced new lending restrictions for property investors to cool the housing market and enable further rate cuts in the coming months. US Unemployment Claims: Thursday, 12:30. Economists expect the number of claims will reach 261,000 this week. The price is located near and above 200 SMA in the bullish area of the chart and below 100 SMA for the ranging market condition. The price is trying to break 100 SMA together with symmetric triangle pattern to above for the price to be reversed from the ranging bullish to the primary bullish trend. Alterbative, if the price breaks 101.73 support level to below so the reversal of the price movement from the ranging bullish to the primary bearish market condition will be started. "Next week could prove pivotal for the markets for two reasons. First, we expect the BoJ to announce policies to re-steepen the JGB curve and even cut depo rates further. Importantly, the meeting may not allay fears that the BoJ is quickly running out of options to ease further. All that could continue to push Japanese long-term yields higher. Second, the Fed should keep rates unchanged but could come out with a relatively more hawkish statement, potentially making reference to a rate hike in the coming months." "The BoJ and the Fed meetings could add vigour to the latest tightening in global financial conditions, and lead to further underperformance of commodity and high-yielding G10 currencies. Growing uncertainty ahead of the US presidential election could also fuel the headwinds for market risk sentiment as we approach the first televised debate on 26 September." "USD/JPY could remain caught between re-emerging policy divergence on the one hand and escalating risk aversion on the other. 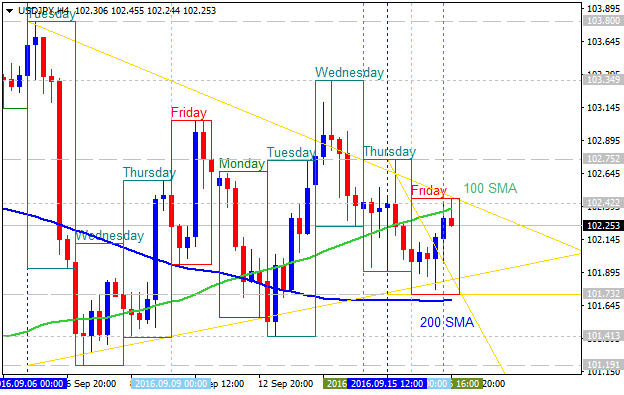 That said, we think that short-term volatility should remain bid ahead of next Wednesday." If the price will break 102.75 resistance level so the bullish trend will be resumed. If price will break 101.73 support so the reversal of the price movement from the ranging bullish to the primary bearish market condition will be started. Last edited by mql5; 09-17-2016 at 04:38 PM. 0.7441 support level located below Ichimoku cloud in the beginning of the bearish trend to be started. Absolute Strength indicator is estimating the ranging trend to be continuing, and Trend Strength indicator is evaluating the future possible trend as a bearish condition to be started. 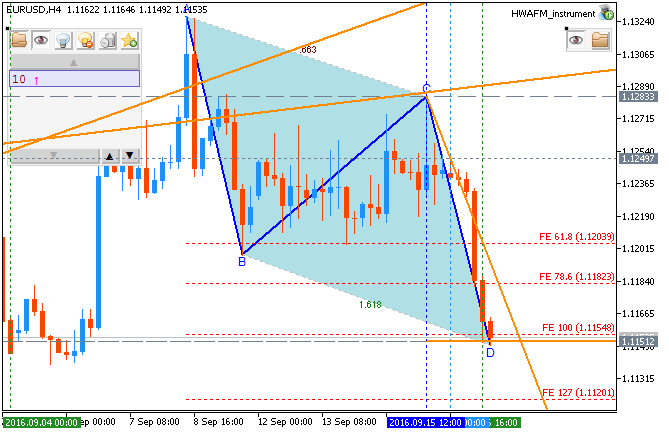 If D1 price breaks 0.7441 support level on close bar so the reversal of the daily price movement from the ranging bullish to the primary bearish market condition will be started with 0.7420 target to re-enter. 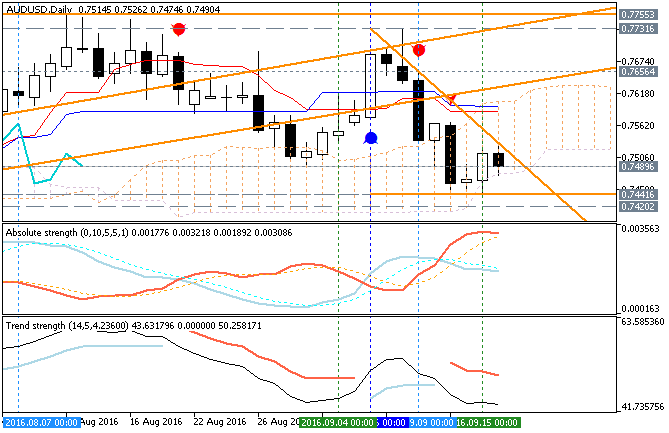 If D1 price breaks 0.7656 resistance level on close bar from below to above so the bullish trend will be resumed.